Ten years ago , I met someone whose life story would make a TV soap opera seem tame. Her name is Carol Pierce. She lived in a community bordering New Orleans, Louisiana. Carol’s adult life has been full of challenges. She endured an abusive marriage, eventually divorcing to protect herself and her children. Carol started sharing her story with others, through articles and books, numerous radio appearances, speeches, seminars, and coaching. Just as she began to enjoy a stable family and business life, hurricane Katrina struck its deadly blow. Along with tens of thousands of other displaced storm victims, she relocated to Baton Rouge, Louisiana. Throughout the decade I have known her, Carol has remained upbeat, hopeful, and buoyant. 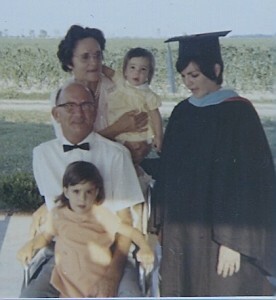 The photo on the right shows Carol in 1971, dressed in academic garb hours before she received her Masters in Education degree. “I’ve never considered my actions as ‘true grit.’ Instead, I’ve always viewed them the same way my daddy did when he was diagnosed with muscular dystrophy the year before I began school and his doctors told him he could give up right then and there the idea of ever being able to walk again or earn a living to take care of me, my mom, and himself.” But Clarence refused to be defeated by their diagnosis. Those Charity Hospital doctors were looking at charts and reports. They didn’t take Clarence’s spirit into account. Clarence Pierce wouldn’t allow the word “can’t” to enter his vocabulary. He opened a small vendor’s stand by the bayou, selling fruits and vegetables. As we approach 2009, many of us confront personal and professional crises. Some seem insurmountable. Clarence Pierce showed us how to succeed. To begin with, omit the word can’t from your vocabulary. I suggest that you bring Carol to your organization. Her story will inspire and challenge everyone who hears her. I welcome your comments, and other blog readers will, too. So after reading this article, you are free to comment. Just go to the end of the blog entry and click NO COMMENTS if none have been made, or if comments have been made click 1 comment, 2 comments, or whatever the comments button says. The comments section will appear.